I have a bit of a bone to pick with you. I have had not one, not two, but FIVE car magnets stolen from me! The first time I was devastated: my Umass class of 2012 magnet, a tie dyed 26.2 magnet, and an hour blast magnet. These things help to define who I am, they’re accomplishments and parts of my life that I am proud of: why would you take them?? 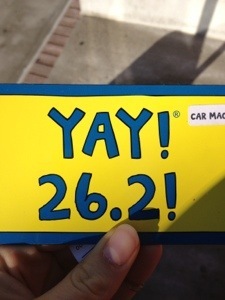 Finally, I replaced my marathon magnet on Sunday. It was a special magnet from the company Yay Life, which has a special place in my heart because I feel like this company shares my general zeal for the world and everything in it…most of the time. And you know what? It was stolen just three days later! What gives? So NOLA, please clean up your act and stop being such a jerk. Filling in some of the potholes would also help. This entry was posted in Uncategorized and tagged car magnets, New Orleans, rant, theft. Bookmark the permalink. Ugh! Stuff like this makes me mad….its not like they have any $$$ value to whoever stole them, they just did it for kicks. I’m sorry!! thanks for the support guys. I was feeling the need to vent! Ew!!!! I would be so angry! Super glue it!